Michelin-starred chef Jérémy Gillon finds his roots in Savoie, France – and stems, leaves, flowers, et al – and transplants them to his new fine-dining joint Restaurant JAG on Duxton Hill. “How did you like your dish, ma’am?” Anant Tyagi, co-owner and managing director at Restaurant JAG, politely enquires of the lady seated at the table next to ours as he reached over to clear her half-finished dish and that of her companion’s. “It’s not to my taste,” was her reply, sending a flash of worry and concern across the F&B industry veteran’s face. When he started to apologise and offers to make amends, she quickly interjects. Restaurant JAG, helmed by chef-owner Jérémy Gillon, is one of the latest proponents of author’s cuisine in Singapore. “Author’s cuisine”, of course, is that modern culinary movement where a chef works unencumbered by rules or tradition, and in most cases, without even a proper fixed menu of sorts. Basically, anything goes. As for Gillon, who earned a Michelin star during his time at L’Épicurien in Val Thorens, France, he regularly sources produce – especially herbs – from his native Savoie in France for use in his whimsical creations in his version of author’s cuisine. Those herbs are even used in the cocktails upstairs at The Lounge Bar. It’s likely to be one of the more uncommon herbs that the lady didn’t take. A taste of bitter sureau – what we call elderberry – perhaps? Each working day, Chef Gillon lets the different top-quality, seasonal ingredients he can get his hands on – seafood, meat cuts, fresh vegetables, as well as those Savoie herbs specially flown in – dictate the five-, seven- or ten-course dinner tasting menu he puts out. There’s a fixed menu for lunch, but what you have during dinner is entirely dictated by Gillon. Dietary restrictions considered, of course. One day it could be celtuce; he poaches the stems to creamy softness, and pairs it with briny caviar and tops it all with origan (oregano). 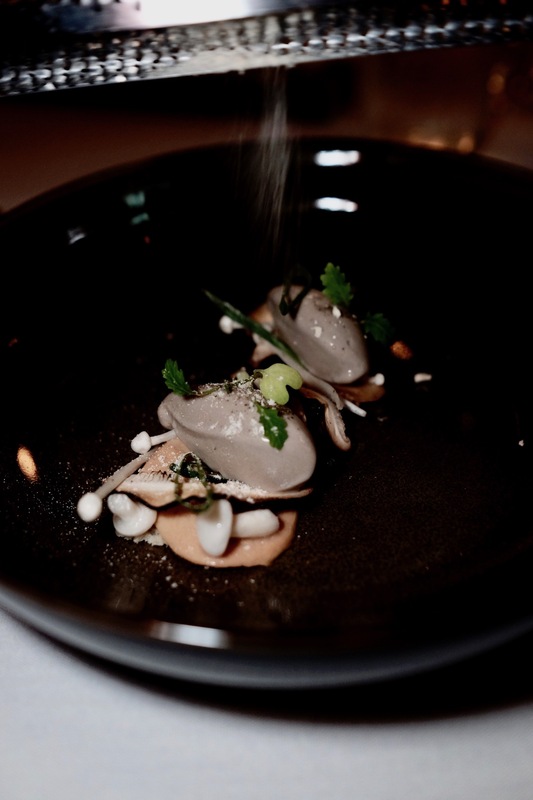 Or it could be ceps, which he makes into an unctuous sorbet and served with perfectly seared foie gras; pickled tops of white beech mushrooms and bouleau (birch) leaves providing texture and flavour counterpoints. If you’re very lucky, like we were, you might get pigeon. Which is unusual enough in the dining scheme of things, but Chef Gillon serves it alongside oca du Peru, tiny but delicious tubers that are similarly rare on restaurant menus here (the first and only time we tried oca was by another author’s cuisine exponent, Chef Fernando Arevalo’s Preludio). If the lady didn’t like her dish, it sure wasn’t from the lack of technique. Chef Gillon is classically trained, and boasts serious understanding of each component ingredient and how to make the best use of them. 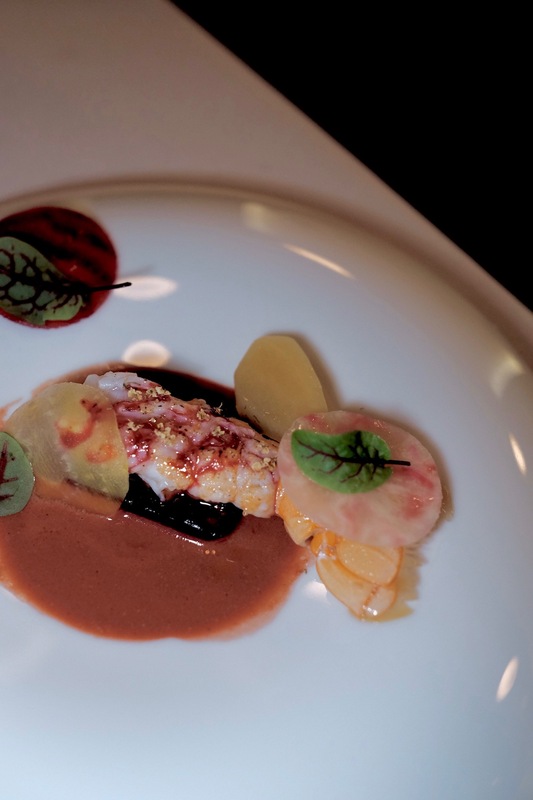 Case in point – our langoustine course came perfect. Langoustine is notoriously easy to overcook, but here the shellfish is just barely cooked to retain all the sweet juices it had to offer. It came swimming in a deliciously light gravy conjured from a jus reduced from langoustine shells and – bizarrely – beetroot, and garnished with sureau. It was a winning combination of flavours – sweet, savoury, and tangy all at once, with even a touch of smoky bitterness. Indeed, if there was just one thing we could critique, it was Chef Gillon’s over-reliance on the use of sorbet; that technique featured in at least three of our seven-courses – including the ceps – during our meal. “At Restaurant JAG I want to give the impression of simplicity. Fresh produce shown at its best and an assembly of tastes and textures,” shares Chef Gillon, who previously spent some time at the now-defunct ME@OUE and Audace. Except such nonchalant simplicity hides a load of culinary complexity. Author’s cuisine, it must be said, isn’t for everyone. By extension, Restaurant JAG isn’t for everyone. And it shouldn’t be. Author’s cuisine is meant to tease, titillate, delight, but sometimes to confuse, and even provoke. There will be dishes you won’t like; some you’ll even hate. But it’s here at such temples of culinary creativity that you taste edible masterpieces when chefs are set free and allowed to experiment and create. For Gillon, it’s modern dining with a touch of Savoie and cutting edge technique. That lady who didn’t kick up a fuss over something she didn’t like? If you truly want to experience author’s cuisine, be like her. Lunch at Restaurant JAG goes for $58++ (three expressions) or $108++ (five expressions). Dinner costs $108++ (five expressions, +$88++ for wine pairing), $168++ (seven expressions, +$118++ for wine pairing), or $218++ (ten expressions, +$168++ for wine pairing).